Plus Size Holiday Scrubs to Bring a Smile to Your Patient's Face! Plus Size Holiday Scrubs to Brighten the Season! Brighten the season with these festive plus size holiday scrubs! It can be difficult to face illness during the holiday season, but these cheerful prints are sure to bring a smile to your patients’ faces. Have fun at work with these plus size holiday scrubs! You will enjoy wearing these adorable scrub tops into the office or hospital, and at this price you can afford to stock up on several different prints. There are lots to choose from! You can select the gingerbread men shown here, Santa Claus prints, Christmas trees or snowmen. There is a turkey print for Thanksgiving, or a blue Hannukah print. There are also a number of prints for Halloween and breast cancer awareness. Why not pick up several to express your personality?! These tops are made of cotton with a touch of spandex for stretch. They have two deep pockets to stash your pen, notepad and other tools. They come in sizes small to 3X. 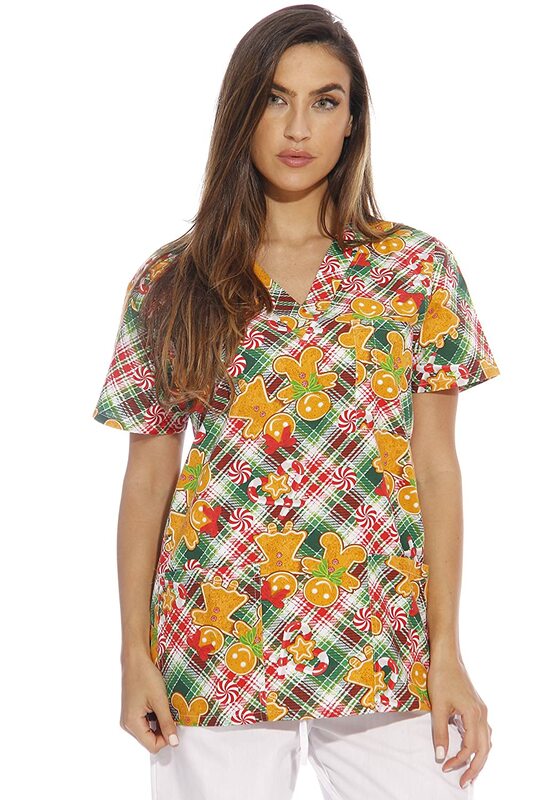 Bring the magic of Christmas to your workplace with these plus size holiday scrubs! I remember watching Rudolf the Red-nosed Reindeer on television when I was a little girl. Back in those days, Rudolf was a tv special that came on in the week or so before Christmas, pre-empting the regularly scheduled programming. We didn’t have videos in those days and had to watch whatever the three stations served up, so it was great to have the option of a kid’s show during prime time! 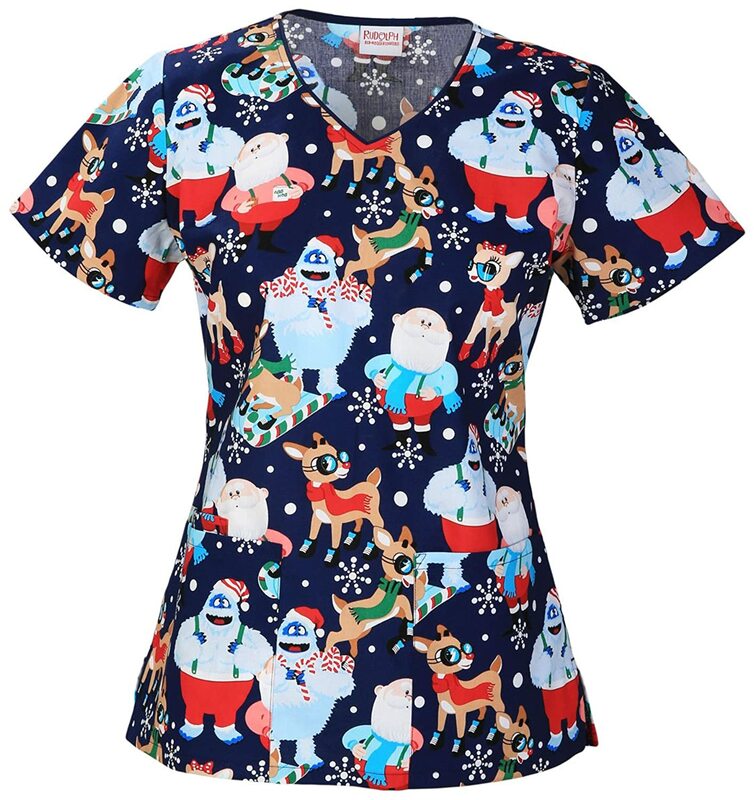 Now you can bring back the joy and excitement of watching Rudolf with this fun plus size holiday scrub top, featuring Rudolf, Santa and the Abominable Snowman on a navy background. Two patch pockets hold your stuff as you go about your workday. This top comes in a size 3X, and is made of a cotton and polyester blend. Be inspired by this nurse who played a special role for her patient on Christmas!